Prime Minister Narendra Modi greets Sheikh Mohammed Bin Zayed upon his arrival on a state visit to India. 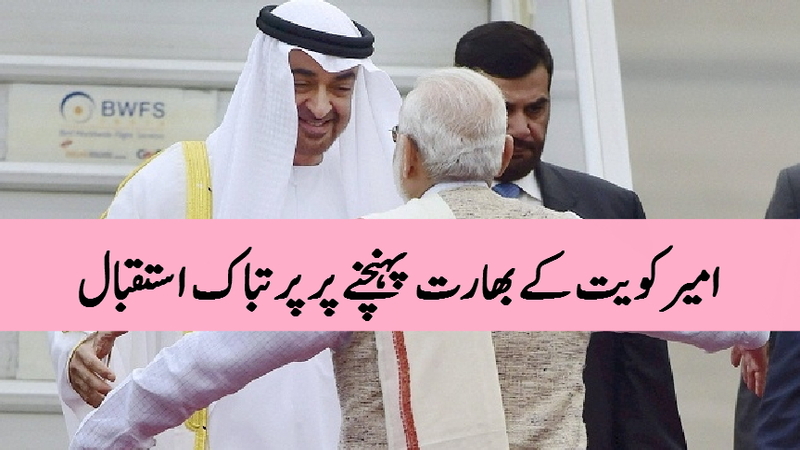 Crown Prince of Abu Dhabi Sheikh Mohamed bin Zayed Al Nahyan and Narendra Modi will first meet for one-on-one talks PM's official residence before holding delegation-level meeting at Hyderabad House. In a special gesture, Prime Minister Narendra Modi received the Crown Prince of Abu Dhabi Sheikh Mohamed bin Zayed Al Nahyan at the airport on Tuesday, he will be the Chief Guest at this year's Republic Day parade. Al Nahyan, also the Deputy Supreme Commander of the UAE armed forces, arrived in Delhi on a three-day visit and will hold comprehensive talks with Modi on Wednesday after which the two sides are expected to sign nearly 16 pacts including Strategic Cooperation Agreement. The two leaders will first meet for one-on-one talks with Modi at his official residence before holding delegation-level meeting at Hyderabad House. Apart from providing boost to trade and investments ties, enhancement of cooperation in strategic areas of energy, defence and security will dominate the talks tomorrow. A Strategic Cooperation Agreement along with more than a dozen pacts including one pertaining to the US $75 billion investment fund, committed by the UAE, will be signed on Wednesday after the talks between Prime Minister Narendra Modi and Crown Prince of Abu Dhabi Sheikh Mohamed bin Zayed Al Nahyan. Briefing the reporters on the visit, Secretary Economic Relations Amar Sinha said "substantial" outcome is expected in the area of defence and security where they will "solidify" their cooperation given shared views on common threat. "Defence and security is emerging as a new area of cooperation based upon shared views and concerns about common threats. We are hoping that this visit would solidify the same," he said, adding there will be "substantial" outcome in the security and defence area. Modi and Nahyan will hold one-on-one meeting at the Prime Minister's official residence before proceeding to Hyderabad House for delegation-level talks, Sinha said. Comprehensive discussions on bilateral, regional and international issues will take place between the two sides. Noting that the UAE has the largest sovereign fund and they are looking at investment, Sinha said there was an agreement that they would invest nearly US $75 billion in India in next couple of years. "During the visit, we are hoping to sign an MoU between their investment fund and our National Infrastructure Investment Fund (NIIF)" which will put in place a framework as to how the fund will be administered and which all sectors it can be invested in, the secretary said. Maintaining that the decision to elevate the bilateral ties to strategic level had already been taken, Sinha said, "However, we are still signing an agreement which is more like an action plan which thrashes out of idea of strategic partnership and brings out concrete idea of what both sides are committed to do." On energy cooperation, Sinha said the UAE has decided to become a strategic partner in energy sector and will be investing and "filling one of our key strategic reserves". "We are hoping that the negotiations will conclude today and we will be able to sign an MoU on that," he added. Apart from key areas of defence, security, energy and trade, the two sides are expected to ink pacts in the field of R&D, agriculture, space among other sectors. With the both sides all set to elevate their security and defence ties, Sinha was asked if the UAE has taken any action against India's most wanted criminal Dawood Ibrahim, to which he refused to give any direct reply and merely said, "Till something happens (we cannot say anything)." However, MEA Spokesperson Vikas Swarup maintained that the ministry does not comment on specific cases. Sinha also noted that the UAE has never asked India to join the anti-ISIS coalition but said the cooperation in intelligence sharing and exchange of information about the specific threats is always part of the discussions. Given the recent terror strike in Kandahar in Afghanistan where many UAE diplomats were also killed, the issue will be discussed between the two leaders, he noted. Describing the UAE as a "key partner" in the Gulf, Sinha said under the defence and security cooperation, apart from joint manufacturing, the two sides were looking at armament, armoured personnel carriers, joint production of aircraft, among other activities. Asserting that the UAE was a major trade partner for India, he said both sides were also looking at signing an MoU on providing remedial steps in case of any commercial differences before going for legal process. The two sides are also looking at cooperation against piracy, on maritime security with Indian officials identifying space, civil nuclear sector and IT services new areas of partnership. The two countries are also working on visa-free travel for diplomats and special passport holders, Sinha said. The MEA officials also asserted that there has been investments made apart from the "big-ticket" US $75 billion fund. They also noted that five to six projects each in highway and railways sectors have been identified for investments.